The rocks poking out of the trees above the lake, opposite the campground. From the campsite, follow the signposted track for Chalwell Galleries to the end of the grassy plain, then plunge right up into the trees and follow the fairly well established track up to the nice low angled slab with two obvious thin flake lines. Not given a star by the guide, but is easily worth it. The L flake line. The flake is trickier and more sustained than its low angle would infer! Some good small wires provide good pro, then easy slab to ledge. Step up to the bush, and the lovely line through the headwall. Good cams protect the lovely crack, which becomes increasingly wide and increasingly flaring, but is great fun! Trusting your footjams avoids any yucky offwidth stuff, then belay off tree. A very enjoyable route. Above Right: Nice view eh? 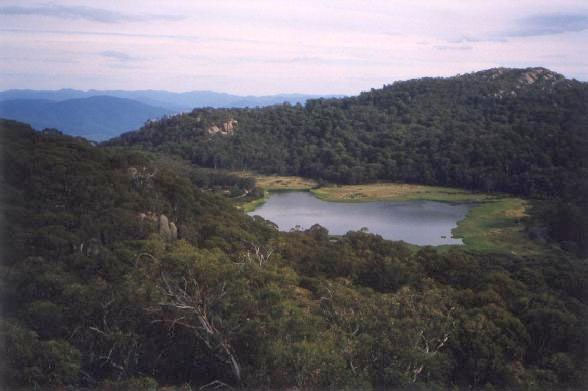 The beautiful Lake Catani as seen from the Monolith, with the campground under the trees at the left end of the lake, Catani Crag poking out from the trees (above the left end of the lake), and Chalwell Galleries on the skyline further left. This is the "star attraction" of Catani Crag - but it's not 20m and not a one star route! Hard to find from the guide too. Sramble up R from KYN until almost at the end of the crag (about 50-60m), then scramble back up L onto the boulders, and over to the slab. A tricky step off the block onto the slab (BB), then nice enough to step L to 2nd BB. Undercling around nose then up creaky flakes. Back 10m to tree belay. Follow the signposted track from the campsite for a good 10 minutes and you can't miss it. The guide is particularly deficient in not mentioning the dangerous downclimb off the top of the tor - keep your second on belay to inspect the correct way down as there is deathfall potential if you get it wrong. Luckily its easy boulder hopping mostly, the only hard bit of downclimbing is the last 6m. Its a great looking crag though, especially the Epic wall! A really great route up your classic granite rounded slabby arete. The unprotected start is a touch worrying, and you'd reckon with the bolts up higher being only 2m apart another one down the bottom wouldn't have gone astray!! Anyway, the unprotected 10m start (about grade 14) leads to rest at break. 3 carrots and great smearing moves lead up the arete just as the amazing view heaves into sight - off the top of the Buffalo plateau practically all the way to Melbourne over the top of the southern Victorian Alps. Mt Buffalo, A Rockclimbers Guide - A climbing guide book, edited by Jeremy Boreham and David Breeton and available from local climbing shops, or the VCC. Wills Climbing Page - Details on Catani Crag & Chalwel Galleries.